Make this Homemade Bang Bang Shrimp Recipe in your own kitchen! Make this Homemade Bang Bang Shrimp Recipe in your own kitchen! Make delicious Bang Bang Shrimp at home. 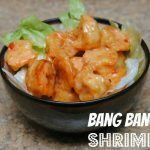 This recipe is makes the best Bang Bang Shrimp! Mix egg and milk in one bowl and mix flour, corn starch, garlic powder, salt and pepper in another bowl. Dredge shrimp in egg mixture and then dip in flour mixture. Fry in oil until lightly golden. (It should only take a few minutes to cook the shrimp).